I won't deny, I was excited about going to see Ghost In The Shell - and not just because it gave me a chance to see if my car was fixed. Turns out I was disappointed on both fronts, but the film got there first. Now I need a new gearbox and I wasted two hours of my life. Just not in that order. Based on the cult classic animation, Ghost tells the tale of a woman who has her brain transplanted into a robotic body following, she is told, a nasty accident. The brain was all that could be saved, she is told. 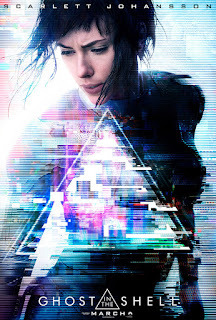 Set in a futuristic Japan that visually owes more than a small debt to Blade Runner, the film follows Major (played by Scarlett Johansson, presumably because all of Japan's actresses were busy) as she goes hunting an apparent terrorist. It's a sci-fi action epic with a spiritual message about what it is to be human. Sure, it looks great, but the longer it goes on the more you just want it to end. To be fair, it's visually stunning, but when you find yourself wondering why a robot with no reproductive organs has to wear a nightie you know you're not engaged with the action. You'll probably also find yourself wondering why ScarJo (as I'm told she is now sometimes known) is playing someone of Japanese origin. Or why, in a world where people are given new eyes and can have their robotic skin replaced, people still zip about on motorbikes. Now, normally, none of this should really matter - but the problem with Ghost is that it's such a cold, clinical, flawed film that it's really hard to get past the issues. And the worst part, for me, is that I'm not even enjoying writing about it. I love writing about films - even ones I haven't enjoyed - but I am really, really struggling to give a toss about Ghost. Kong annoyed the hell out of me and was a terrible film, but I'd rather watch that again than Ghost. And I hate admitting that. A film should always make you feel something - be it positive or negative - but to leave a cinema feeling nothing? That should be a criminal offence.